1. Dietary habits:- It has been surveyed that one of the major cause of cancer is the improper and unbalanced diet. It has been observed that the person taking diet rich in trans fats and red meat are at the higher risk of cancer. In western countries cancer is prevailing at faster rate as they take diet rich in non-vegetarian products. In the countries like India, vegetarianism is followed on large scale thus here the cases of breast cancer and esophageal cancer is less. A relation has been observed between the meat eaters and colorectal cancer or colon cancer or bowel cancer. It has been estimated that about 1.23 million colon cancer cases are diagnosed worldwide and out of which 608,000 has lost their lives due to this. It has been advised to keep your diet balanced and to take diet rich in vegetables and fruits. 2. Alcohol:- Consumption of alcohol has increased the risk of cancer to an great extent. It has been observed that alcohol intake is the one of the major cause of colorectal cancer or colon cancer. About 9.5% colorectal cancer are caused due to intake of alcohol. It has been studied that women who consumes 10 gm of alcohol are at the highest risk of breast cancer than those who does not consume alcohol. 3. Tobacco:- Consumption of tobacco in any form like smoking, chewing and direct intake is responsible for causing maximum number of cancer cases. About 51% of cancers worldwide are caused by the intake of tobacco in different forms. Tobacco is major cause for cancer of oral cavity, lungs, esophagus, larynx, pharynx and urinary bladder. Tobacco contains about 70 cancer causing substances which spread in your body through lungs when you smoke. These chemicals affect the DNA and change the genes which lead to multiplication of cells in abnormal way. 4. Radiation:- About 10% of cancers are caused due to the radiation. The effect of radiation is same in developed as well as developing countries. Prolonged exposure to sunlight can affect your skin and can mutate the skin genes as sunlight contains UV or we can say ultra violet rays and can lead to skin cancer. Other radiations like magnetic and radioactive radiations can also affect our body and led to cancerous affect in body. 5. Environmental pollutants:- It is estimated that 90% of cancers are owed to the environmental pollutants and parasites. Various viruses and bacteria are also responsible for the cancer to different parts of the body. Risk of lung cancer increases due to the outdoor pollutants. 6. Obesity and immune system:- Cancer is more prevalent in the body whose immune system is weak due to any early health problem. It has been observed that people who are obese are more prone to cancer. 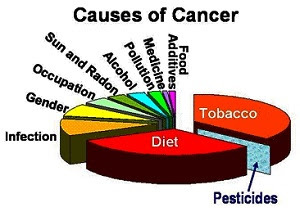 All these factors are responsible for prevailing cancer in our society. There can be many other factors also but these are some of the major causes which can lead to the deadly cancer. If we take care of these causes we can save ourselves from this fatal disease to some extent.